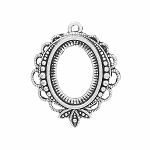 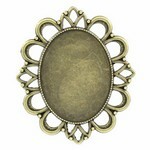 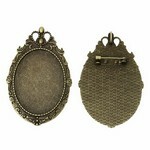 We sell a large variety of cameo settings and cabochon settings, brass bezels frames and trays. 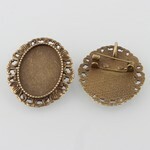 The vast majority are simple glue in settings. 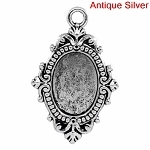 Settings are listed by the stone size they fit. 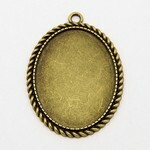 For example if you have a 40x30mm cameo you will look for a 40x30mm setting. 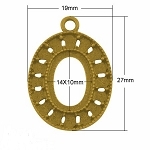 116st 30x22mm raw brass bezel. 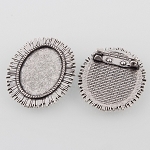 Please note that some cameo settings have a brooch pin on the back, some you must glue or solder a bar pin on. 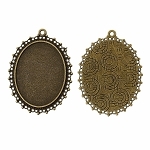 Some have a bail or loop so you can hang them and are used for cameo pendants, necklaces or dangle earrings. 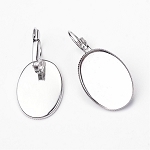 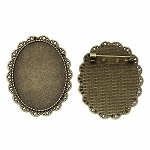 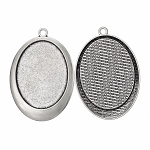 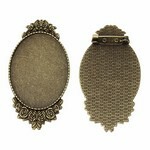 We also have cabochon settings that have the pin mounted horizontally as opposed to the typical vertical pin. 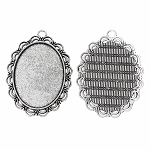 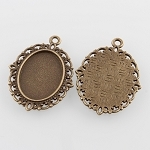 There are a few trays such as lace edge bezels that do not require glue, you simply bend down the metal edges to hold the cabochon or cameo in place. 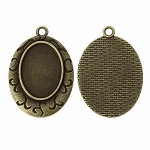 Most of the products are going to be made of base metal or brass with a plated finish. 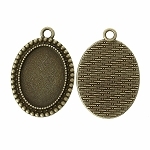 Finishes can be antique bronze, silver, or gold. 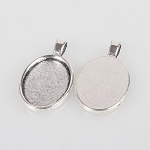 You will also find some raw unplated settings. 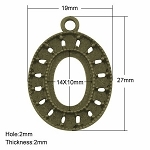 Please select the size you need below.